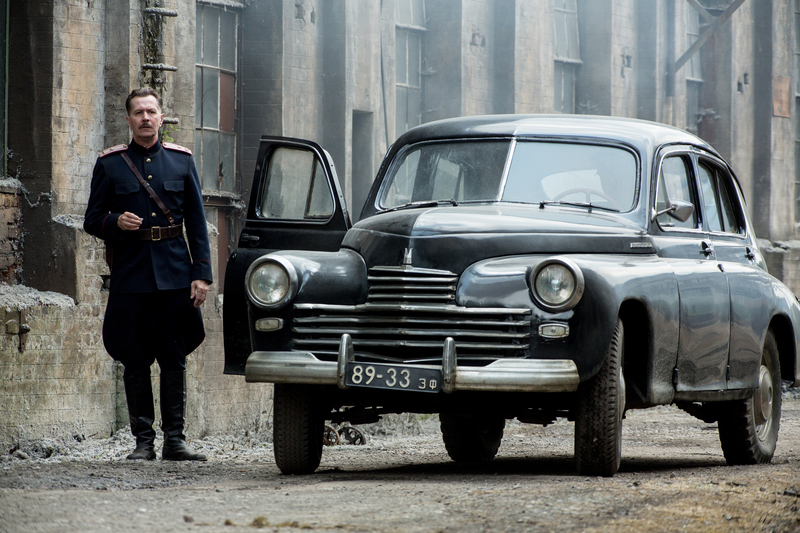 Post-war espionage thriller set in Stalin’s pre-KGB Soviet Union, starring Tom Hardy, Noomi Rapace, Gary Oldman and Paddy Considine. 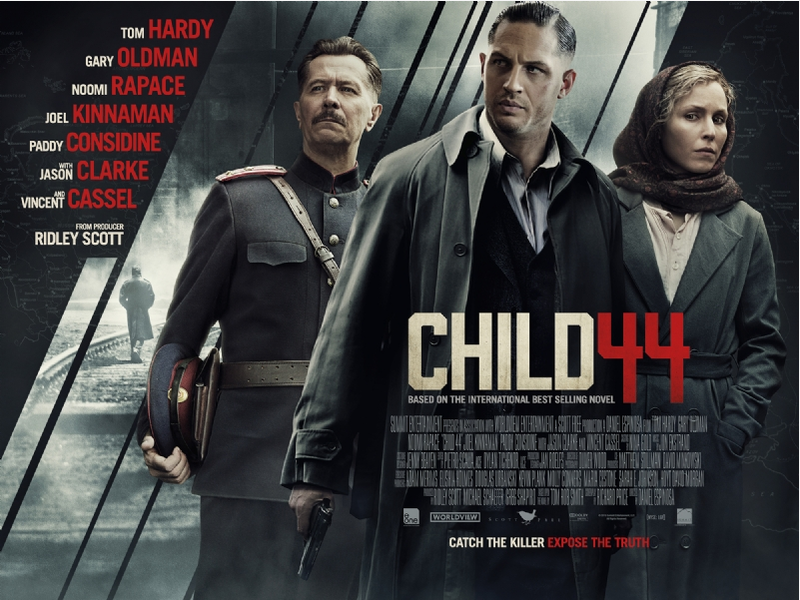 Based on the award-winning novel by Tom Rob Smith and produced by Ridley Scott, Child 44 is a brutal post-war thriller but not for the usual blood and guts reason. This is more psychological, more harrowing and more gut-wrenching than any action movie and I’d liken it more to Schindler’s List than Where Eagles Dare. It worked. The state was everything: all-seeing, all-giving and all-powerful. “There is no murder in paradise” was one of its mantras, so when a series of child killings begins to unfold, nobody dare say the word – not even the father of the latest victim. Much like in East Germany under the Stasi, the secret police have eyes and ears everywhere and “traitors” disappear in the night, never to be seen again. Living in fear for their very lives, it’s a miserable paradise for the people with the ever-present threat of being sent to Siberia or some other cess-hole looming over everyone, every single day. There are some men and women of principle though .. or are there ? What would you do to survive and protect the ones you love ? With a magnificent cast – Gary and Paddy in the same movie !! – I had high hopes for this rather low-key release and I’m glad to say it didn’t disappoint, despite being a very difficult film to sit through at times. The plot moves steadily so it’s not one of those films where you’re not sure what’s going on, but there are lots of subtle twists along the way .. so much so that you begin to question everyone, wondering what their angle is and whether they’re on the level or not. It’s nigh-on impossible for someone from the west to imagine the mindset of anyone brought up under Stalin and I knew next to nothing about the events depicted in the movie. 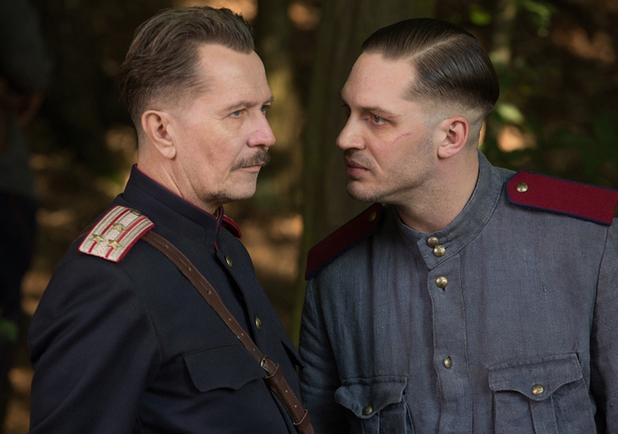 Luckily, I went with a Ukrainian friend who confirmed that pretty much everything was true, including the unspeakable truth at the heart of the movie – an atrocity committed by the Nazis – which beggars belief. As usual, no spoilers for me, but trust me when I say it was a shocking revelation, leaving me wondering more than ever about the machinations of the Third Reich in general and Dr.Mengele in particular. I can’t really say much else without giving too much away, but if you enjoy hard-hitting, psychological story-lines and can stomach some realistic violence then I would urge you to see this while you can. The fact it’s been released at a time when the Red Army appears to be flexing its muscles on the world stage again just adds another layer of intrigue to it all to me. This is a brave movie but one that needed to be made. It’s not a Friday night popcorn flick or a date movie though .. you have been warned. This entry was posted in Uncategorized and tagged cinema, cinema review, cold war, critique, espionage, film, film review, gary oldman, hitler, KGB, MGB, military history, movie, movie review, nazis, noomi rapace, paddy considine, political thriller, review, ridley scott, secret police, soviet union, spy, spy movie, stalin, thriller, tom hardy, USSR, world war two, WWII by rigger67. Bookmark the permalink.